NEKTON-E is a supplementary feed that consists of the biologically effective and durable vitamin E component α-Tocopherol. NEKTON-E helps to protect the cell membrane, decontaminate metabolites, hormone production and muscle functions. Furthermore, NEKTON-E primarily improves animal fertility, embryo survival rate and viability of young hatchlings. NEKTON-E also encourages the entire cell metabolism, anti-body production, increased defenses and has a positive effect on the body's immune status. NEKTON-E supplements the minimum content of vitamin E in feed and covers the animals' needs with these nutrients that are so important for the body. NEKTON-E is soluble in water and is administered daily in drinking water, or mixed in with soft feed. Ideal in combination with NEKTON-S and NEKTON-MSA. 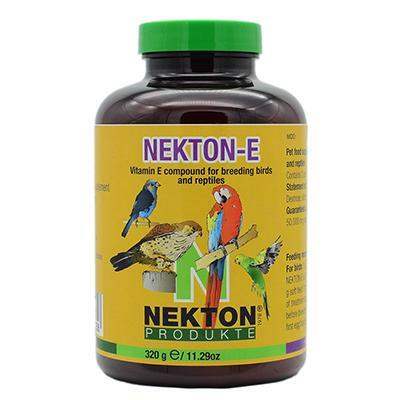 For birds: 1 g (1 level measuring spoon) of NEKTON-E in 250 ml (8.5 oz.) drinking water or 100 g (3.4 oz.) soft feed. It should be used as a course of treatment starting at least three weeks before breeding and stopped as soon as the first egg has been laid. Other animals: 0.5 g daily (½ measuring spoon) of NEKTON-E per kg of body weight, in each case as a course of treatment over a period of around 14 days. NEKTON-E should be stored dry and out of sunlight, between 15° and 25° C (59° and 77° F). DO NOT STORE IN THE FRIDGE !! !